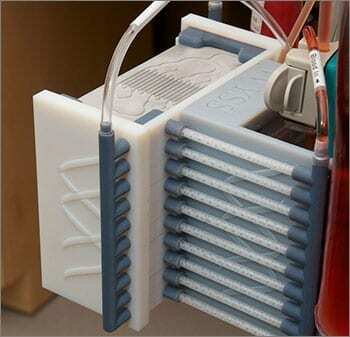 The device will be used to treat bloodstream infections that are the leading cause of death in critically ill patients and soldiers injured in combat. The Wyss Institute for Biologically Inspired Engineering at Harvard University announced today that it was awarded a $9.25 million contract from the Defense Advanced Research Projects Agency (DARPA) to further advance a blood-cleansing technology developed at the Institute with prior DARPA support, and help accelerate its translation to humans as a new type of sepsis therapy. To rapidly cleanse the blood of pathogens, the patient’s blood is mixed with magnetic nanobeads coated with a genetically engineered version of a human blood ‘opsonin’ protein that binds to a wide variety of bacteria, fungi, viruses, parasites, and toxins. It is then flowed through microchannels in the device where magnetic forces pull out the bead-bound pathogens without removing human blood cells, proteins, fluids, or electrolytes — much like a human spleen does. The cleansed blood then flows back to the patient.